Dental Designs is based on the concept of healthy teeth for life - by design, not by accident, luck or chance. Our approach to dentistry is drawn from our approach to life itself where we believe that the best designs are those that do the most good and work the best for people using them. We took this belief one step further by opening Dental Designs at Manitoba Hydro Place which itself is built around a sustainable energy-efficient design; making it both unique and special. The architectural solution of the building clearly relies on making use of passive free energy without compromise to design quality and most importantly, human comfort. Reducing energy by using LED lights for accent lighting, and using motion sensing,low consumption fluorescent lights for rooms. Recycled materials were used in our office construction. For example bamboo cabinetry, recycled glass for counter tops, and zero VOC paints and glues. Reducing harsh chemical dumping by minimizing the use of toxic substances and using only digital x-rays. This means there is no lead waste from the x-ray liners either and the radiation is 1/8 of regular film based x-rays. Our sterilization procedures are either steam or peroxide based which again have no phenols or gluteraldehydes. Most importantly we are an Amalgam-free dental office as we use only white composite material for our restorations. Reduce paper usage by doing away with all paper based records, forms & invoices and computerizing all such processes instead. Reduce water consumption by switching to an eco-friendly dental suction unit called TurboSmart and saving up to 200 gallons of water a day. 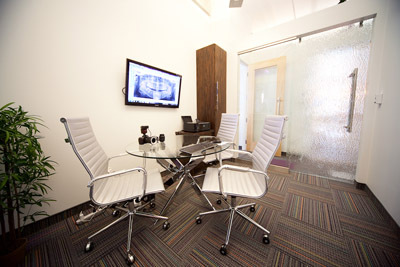 Without doubt Dental Designs at Manitoba Hydro Place offers excellent dental services in an environment like no other. It truly is a marriage of like-minded solutions where energy efficient design meets our services; both of which help enhance the quality and comfort of human experience. We obviously take great pride in the fact that Dental Designs is as invested in creating a supportive workplace for our team members as it is in delivering on all your dental needs in the least invasive and most comfortable way possible. It is no surprise that people leave our clinic feeling great about themselves and ready to take on life with a whole new confidence.